The digital workspace has arrived, and the most progressive organizations are taking action. To thrive in this digital environment, organizations need to embrace strategies that better prepare them for success in the growing digital economy. Understandably, this means working toward becoming highly mobile enterprises. Throughout this process, an organization’s technology partner choices can play a pivotal role in achieving business goals. As such, stability and scalability are taking center stage. This is why a forward-looking solution can empower an organization to move away from standalone enterprise mobility management (EMM) to the digital workspace. 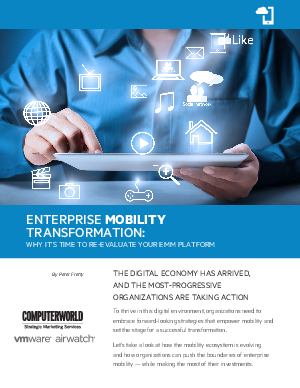 In this white paper, we’ll take a look at how the mobility ecosystem is evolving and how organizations can push the boundaries of enterprise mobility while making the most of their investments. For MobileIron customers making a migration decision, selecting a partner with solid leadership, stability, scalability, and steady growth will be as important as any other solution benefit. Download the paper to learn more.